The virgins were to “meet the bridegroom” at the bridegroom’s house, which, since the Savior is the Bridegroom (D&C 33:17), is symbolic of our latter-day house of the Lord, or temple. As the marriage ceremony takes place in the bridegroom’s house to “teach about qualifying for the kingdom of heaven”, so does the sealing marriage ordinance in the temple today qualify us for entrance into the highest degree of the Lord’s celestial kingdom in heaven. 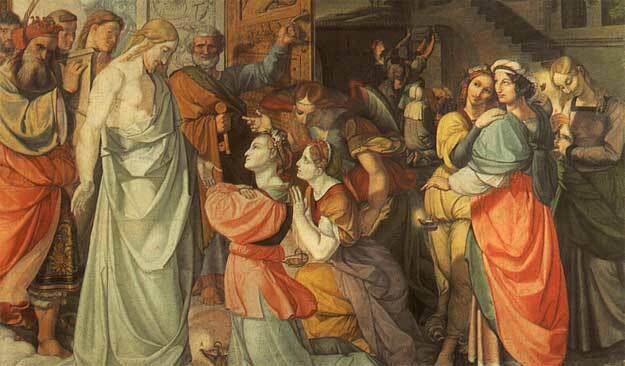 The ten virgins represent members of the Church, some wise and some foolish, but all members of the Church. Those wise virgins with oil in their lamps were able to enter the bridegroom’s home. Likewise, church members who are worthy of and have a temple recommend are allowed into the temple. Constant effort had to be taken to ensure that oil was in the lamps in biblical times, as does our effort today to stay temple worthy. The virgins without oil in their lamps were not permitted into the house, as are church members without a temple recommend. Olive oil in the lamps is a symbol of purity, as is a temple recommend today a symbol of personal worthiness. The foolish virgins could not borrow oil from the lamps of the others. Today, a church member cannot loan a temple recommend to another. Elder Robbins continues to discuss how the Bridegroom was the keeper of the door at the marriage supper, so is the Lord the literal “keeper of the gate” at the entrance to the celestial kingdom (2 Nephi 9:41), which entrance is also represented in the temple. Robbins notes that the Lord will “symbolically be checking recommends at the door to the kingdom of heaven,” but this checking will also be very literal, as endowed temple members will quickly recognize. The article concludes that we should consider these comparisons between the scripture parables and our participation in temple worship today, which should motivate us “to desire to be temple worthy.” And I would add, to attend often as well. One may well ask, since the symbolism and references to the temple seem so clear and extensive, did the Lord have the temple in mind when he gave the parable? Part 2 will be about the temple imagery in the parable of the talents. This may be one of the most meaningful articles I have ever read concerning the Temple and preparation for the temple. Every member should read and study this article in detail. Thanks for bringing it up again. I thought it was excellent as well. A lot can be learned from the parable, and how we can prepare ourselves for the return of the Savior. We must ready ourselves as the wise virgins for the marriage supper. If we are not worthy of a temple recommend, then when the Lord comes “suddenly to his temple,” we will not be allowed in.